I have decided to just watch up to the end how the UEW saga ends but it seems UEW council is in a disarray because of external inferences and among the inferences is Alex Afenyo Markin's position in UEW as UEW OVERLORD. It is very dishearthening to hearing that UEW council chairman, Prof. N. E. Abakah and Prof. Rev. Afful-Broni are under the control of Alex Afenyo Markin. I learned Alex Afenyo Markin made a staff who has the ambition to contest for the NPP chairmanship position in the Effutu consistuency to be transferred to Kumasi. I learned there is suit at the Cape Coast High court and based on that the council chairman decided to veto the appointment of Prof. Rev. Afful-Broni as Ag. VC because there will be a vacuum and also because of findings from a fact finding committee report. The fact finding committee is also part of the suit but the council chairman decided to disregard what is before the court and went ahead to appoint Prof. Rev. Afful-Broni as Ag. VC. The appointment too is not inline with the UEW statutes. Dear reader, I also learned that because of the suit filled at the Cape Coast High court, Alex Afenyo Markin through Supi Kofi Kwayera has filed a writ at the Winneba High Court Judge asking the court to declare the previous council defunct and the likes. Alex Afenyo Markin did that because he knows that Justice George Atto Mills-Graves will give judgement in his favour. The main plan was, Prof. N. E. Abakah and Prof. Rev. Afful-Broni don't be afraid. If they sue you and the University, I will also sue the University and MOE and I know MOE will not appear so let the University lawyers appear with weak defense or they should not appear at all so that Justice George Atto Mills-Graves will give judgement in my favour and before legal issues are addressed, Prof. Rev. Afful-Broni will still be acting as VC. I hope Ghana's justice system will work perfectly so that corrupt judges would be made to leave the service as done in the Anas' exposé. Is the justice system not working well in Ghana? Yes, to some extent. For instance, the Winneba High Court Judge, Justice George Atto Mills-Graves has put UEW in her present state by granting an injunction application (which was later quashed by the Supreme Court of Ghana) by Alex Afenyo Markin through Supi Kofi Kwayera. I was informed that there is going to be some voting bi by some segment of the University community and that one Dr. Bekoe is one of the contestants and he has been on UEW council and want to be relected to serve his final term. I was told because Dr. Bekoe always wanted the council chair and co to do the right thing, some council members have teamed up to fabricate a story that they think may make him unpopular in the eyes of those who will be voting. I CHANCED ON Dr. Bekoe's response and below is his statement. My attention has been drawn to a write up circulating on social media platforms accusing me of throwing tantrums at the UEW Governing Council meeting that was held on the 22nd of February, 2018 and ending up by threatening to attack some members of the Council, including the Oman Odeefe of the Efutu Traditional Area, Neenyi Ghartey, with machete. I would like to state emphatically that no such thing happened at the said meeting. I am partly Efutu and Neenyi is well aware of that and thus will not threaten his life. Indeed, just after the inauguration of this Council, Neenyi, recognising my kinship relation to the Efutu State and my personal disposition invited me to his house to have a chat about the UEW issues. The only disagreement that involved me at the said meeting was between the Chairman and I, and it was when he, in total disregard of provisions in the Statutes of UEW, started reading an obviously preprepared statement and purported it to be Council decisions indicating the appointment of the Pro VC, whose term of office expires on the 28th of February, 2018, to act as VC until the substantive VC is called back. And also the fact that Council was establishing a disciplinary committee to deal with the recommendations of the fact-finding committee. In the above instance, my response was to draw the Council Chairnan's attention to the inappropriateness of his actions and the fact that those decisions were contrary to the Statutes of UEW, which we have all sworn to protect. The Chairman disregarded my protestations and went ahead to call for the meeting to come to an end. I immediately left for the house, since I needed to ensure that my kids were safe and sound. Early this morning a member of the Council called to inform me that as soon as I left the meeting chamber, one of the students' representatives on the Council walked to the Pro VC and informed him that he heard me issue a threat against them that I was going to attack them with a machete. I was as surprise as my colleague when I heard this, since I never threatened any of them and he sitting closer to me also didn't hear me issue a threat. I have come to see this as a calculated attempt to destroy my integrity before all right thinking people. I however want to assure all and sundry that the verdict is already out there and I will not be perturbed by this infantile attempt to destroy my image. I am far beyond this kind of shenanigans. I still remain yours sincere and faithful servant, DR. SAMUEL OFORI BEKOE and will continue to fight against injustices and inequities in the system. Where truth stands, lies and manipulations shall never prevail. Thanks for your reading time. 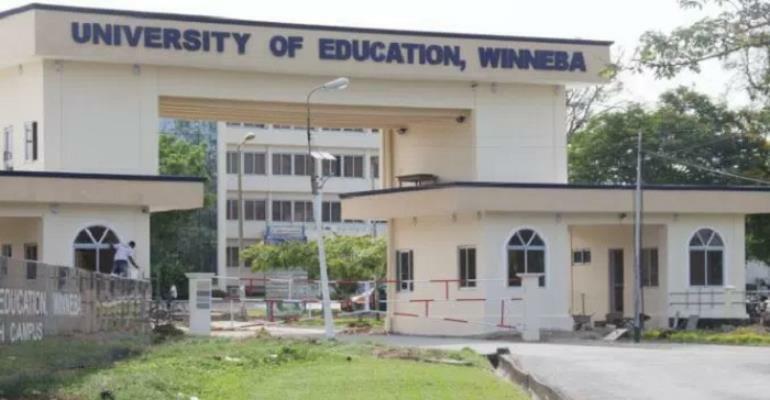 Is The University of Education, Winneba A Glorified High School?